Ok, so you may be thinking this combinations sounds disgusting. weird. unnatural. strange. But please at least give it some thought. The EVOO give this cake a very dense moist texture with some hearty floral notes that compliment the cherries. The polenta/corn meal gives structure and adds to the texture and overall mouth feel. The cherries add sweetness and another dimension to the dish. All of the flavors are there for a reason. It may sound strange, but it is very delectable! The first thing that needs to be taken care of is the cherries. It might be a mess to pit them, but at least you'll have a chance to sample some of them! 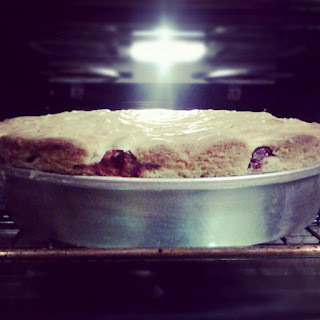 Pour two thirds of batter into prepared pan, and completely cover it with cherries. Spoon remaining batter over cherries, allowing fruit to peek through in spots. Bake until top and edges are lightly golden and a toothpick (or fork) inserted in the center comes out clean, 1 hour to 1 hour 25 minutes. (I used a 9'' pan and it took about 1 hour and 30 mins.) Remove from oven and cool pan for 10 minutes. Remove cake from pan and cool completely. (I never let it cool completely. It's ok. Go ahead and dig in!) Cut the cake, and serve each slice with a dollop of cream.